Complete ‘drying’ of the skin glow. That base make-up focuses on covering is an old-fashioned story. Today, it started to gain skin-care function which cares under the skin. Furthermore, it sometimes gives up covering in order to express silk-like young-aged skin. Every cosmetic company releases its own treatment-containing foundation and offers to sustain skin-care all day long, which was considered to be a morning-and-evening routine. That’s silly, because it’s a common function among every foundation. Hangul, Korean alphabet is so beautiful and has an infinite expressiveness. I’m so proud of Hangul. Combining words opens wallets. But, the point is that it’s impossible to change skin tones, while its skin-care substances caring the skin. It’s not my narrow-minded opinion, as anonymous eminent make-up researcher proved it. I guess it’s an open secret. You might know, and your mother-in-law might know. There might be none who buys tone product expecting its skincare effect. It’s not easy to get skincare effect with specialized skincare product…but skincare substance in tone product…the effect can only been shown in case the substance pass through the skin. But in tone product, the substance is trapped by the product’s particles. But for one point! The effect can be maximized just in wearing the product. The skin can be seen brighter in the moment wearing the make-up. If you didn’t get the enough effect from basic products, how silly is it to think the tone product can give you whitening or wrinkle care! Today, compact foundation comes in series. 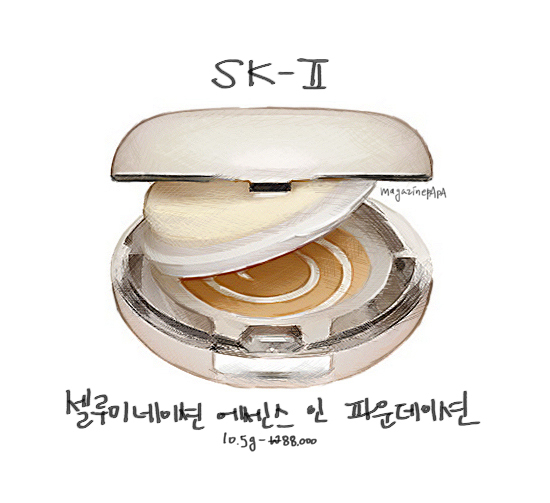 Now I want to talk about two SK-2 compact foundation which affected domestic products in a Japanese idea of putting skincare substance in foundation. 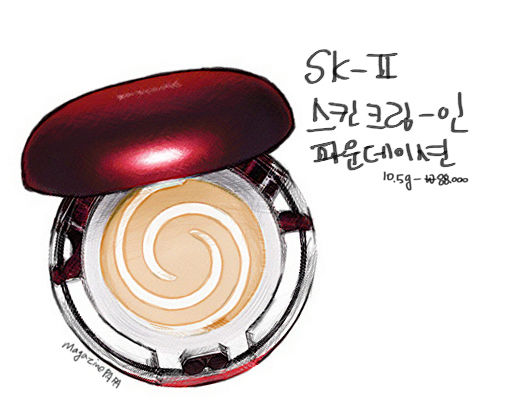 SK-2 explains that it contains whitening essence, and most of all, it brings continual care even during day time as it stays on face for all day long. The salesman says it has whitening effect which makes it a perfect product for spring and fall. He adds melanin-care effect prevents pigmentation. So I asked if it has sunscreen effect. He explains Japanese food and drug administration certificated while Korean food and drug administration didn’t certificate. That kind of makes sense, but it’s hard to believe about food and drug administration certification, as food and drug administration is not a stubborn group. I don’t get the point he mentioning it. Let’s get to know this product confirming its not having whitening effect. Every brand has different foundation color, but I’m using the brightest color among all the brands. But SK-2’s brightest color is little pinky and has a bit floating feeling, which makes my skin can’t take advantage of this product. I guess only ones with white and bright skin can use it. Then I used second brightest beige toned #310. It goes with Korean skin tones pretty well, but it’s not good idea to order it online blindly as everyone can choose their best color among various brands. It’s special in its soft feeling finishing touch, but it’s pretty matt to my skin. You may say it’s original ‘powdery’ finishing touch, but it easily floats over skin and sometimes crumples. I never had dry skin, but I always prevent the feeling of dry. So I never use products giving matt feeling. I give these dry products to friends with oily skin not to throw $ 75.61 away. Sometimes I feel dryness even though not wearing powder. Workload makes me not recognize it, but break times makes me focus on my face. AWW! My face feel so tight! It’s not without covering effect. It depends on how much you apply, but on condition that it has to seems natural and pretty, the covering ranks ‘middle high’. It covers little pores and light blemishes, but it doesn’t have perfect covering. Well, pouring might work. But I don’t do that. I was once had terrible oily skin and full-of-pimple skin, so I have big pores on both side of nose, which can be covered by only foundation. This one covers that size of pore. Sustainability is so-so. Ordinary people with relatively good skin may be satisfied with it. It might help to express smoother and brighter skin although it doesn’t have great covering. It’s a quiet good product for oily skin… not for oily skin with persistent troubles. In conclusion, neutral, dry skin doesn’t fit with it….it doesn’t mean it fits great with oily skin. Hmm, the price, covering….well I can’t suggest this strongly…It’s your choice anyway! Just, people with rare type of skin. There’s skin too light to get any type of foundation. With it, they can’t imagine to fix the make-up. This matt and hard product might help those people. So It’s good for them to try it out. ’Test’ doesn’t mean applying it on hand for a one time, neither does it mean apply it with one touch with a brush. It means applying at least half the face. so it express as a originally good skin at the moment of applying. Also, it transforms into powder and covers pores and dry skin at that moment. Now, here goes my think. I asked a salesman about difference between the white one and the red one. Actually, it’s marketed as different products…but I couldn’t figure out the difference between them. The white one has a good covering and whitening, and the red one is skin food and a watery one? You mean Skin Cream In Foundation is watery? I doubt we can call this a watery one. The difference is hard to be noticed with regular sensitivity. but ‘watery’ is hard to define clearly. Theory of sunscreen effect of Cellumination Essence In Foundation was funny, but explanation about this Skin Cream In Foundation is a highlight. Watery products lose their moisture as time goes. It’s a funny theory…doesn’t make sense. SK-2’s idea was a real sensation. Add to putting skincare in foundation, they highlighted it with striking white color. It was projected to drag women’s eyes. We can’t say it doesn’t have any moisturizing effect. But emphasizing other functions is not even worth listening. I feel little angry to see my sister buying it expecting the so-called wonderful function. Well, people believing the skincare effect of tone make-up might get embarrassed, I’m sorry for them. Color seems to go fine with skin tone. but as a cream foundation…it is kind of useful. I guarantee you that it’s impossible to express Lim Su-Jung’s perfect skin by using only this product. It might be useful to ones with need of matt-feeling compact foundation or ones with little bit of pores. I decided not to buy SK-2 Foundation with my own money. It might be better not to emphasize the functions to get my expectation. It just doesn’t seem to be a good one. Shining skin SK-2 talks about is never a easy one. Skincare must be supported and it means extrinsic efforts like eating foods which keep skin shine, and massage or detox care might be more effective. I would select La Neige rather than SK-2. Of course Chanel is my No.1 by now. To ones who request reviews about SK-2 compact I think today’s posting might be enough. I’ll try to post one on 3~5days. I can’t promise for sure, though. Let’s get over this dark and rainy days. Oh, don’t forget skin is affected by ultraviolet even during rainy day!